If you’re anything like myself, you find that there just aren’t enough hours in a day. This shouldn’t mean that you are neglected; we’ve got to feel good in the midst of our hectic schedules. 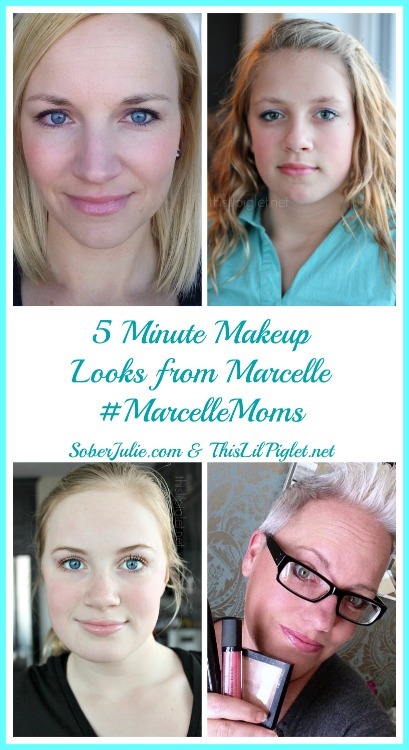 As a #MarcelleMoms advisor, I’ve had the opportunity to try out a number of Marcelle products and today I’m bringing you a few which I use for my 5 Minute Makeup Look. I’ll also be linking in with my fellow #MarcelleMoms Stacey from This Lil Piglet who has created 3 looks for you to see. She’s bringing one look of her own and 2 from her amazing Tween girls. Before I put on any makeup I take care of my skin by cleansing and moisturizing. 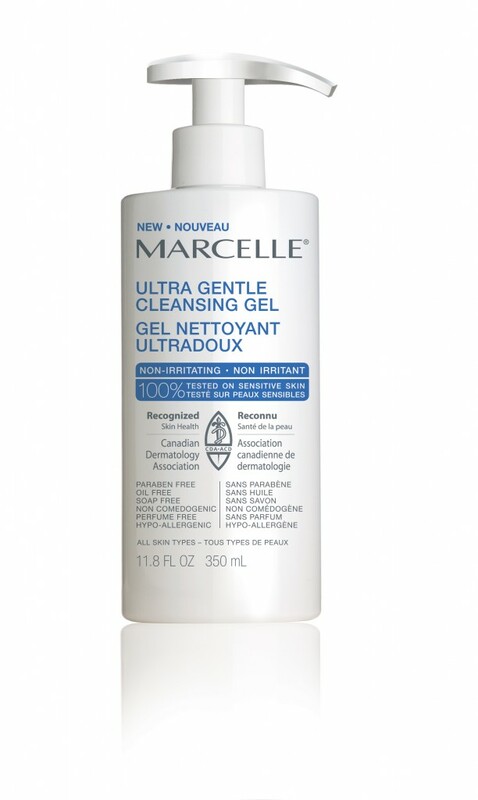 Marcelle has recently launched the Ultra Gentle Cleansing Gel which which bears the official seal of recognition of the CDA’s Skin Health Program. Marcelle is the #1 eye make-up remover brand in Canada and is now thrilled to bring forward an ultra-mild and non-foaming facial cleanser which is gentle enough to be used by the entire family. This cleanser is enriched with aloe vera and glycerin which protects the skin’s natural barrier. 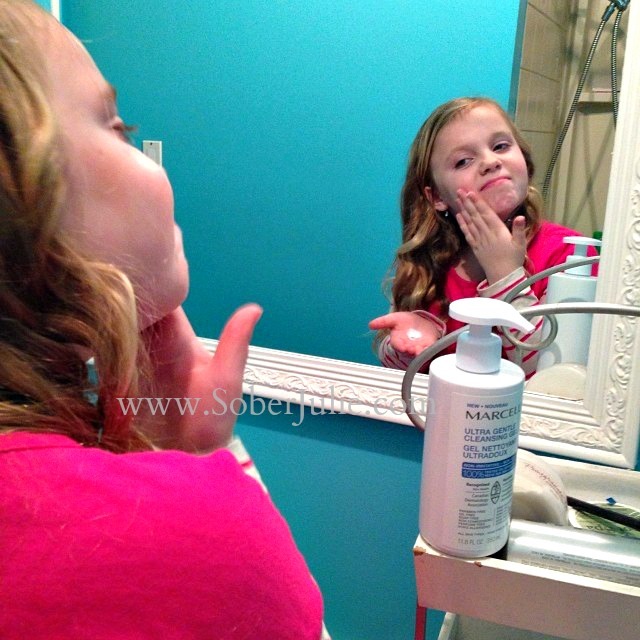 Our entire family has been using the Ultra Gentle Cleansing Gel for a little while now and it’s been a great way to begin to teach the girls about skin care. My daughters are performers in a local theatre company which means they are wearing makeup, this makes it even more important to have a product which is gentle enough for their skin and cleanses well. Lips: Marcelle Lux Gloss Cream in Belissima (SRP $10.95) This gloss goes on smoothly and has a supple texture which didn’t dry out. It has a semi-sheer look which ended up making my lips appear fuller. Eyes: Marcelle Xtension Plus Mascara + ProLash Growth Complex(SRP $14.95). Lashes are a must for me, as someone who wears glasses if I don’t wear mascara I’ve found my eyes simply get lost. The Xtension Plus Mascara + ProLash Growth Complex was developed when Marcelle took the existing Marcelle Xtension Plus Mascara and added multifunctional conditioner to stimulate the growth of healthy lashes. This mascara truly covers the whole lash, from root to tip. I had NO flaking and it makes my eyes POP. I really like it, no effort and plenty of effect. Face: Monochromatic Pressed Powder in Medium(SRP $19.95) When I am running around town or just doing more casual activities, I reach for a powder to help even out my skin. Marcelle’s Monochromatic Pressed Powder is now my favourite. To say I have been disappointed in the past with other powders is an understatement; from no coverage to disappearing far too soon, I’ve experienced it all. Marcelle’s Monochromatic Pressed Powder went on evenly and has a silky feel against my skin. It is a lighter coverage than the liquid choices but I was very pleased how it helped even my skin tones which tend to look red without powder. That’s all I used for my casual 5 Minute Makeup Look. 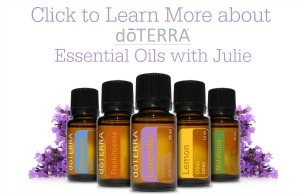 3 must-have products which are very well priced for the quality they are. 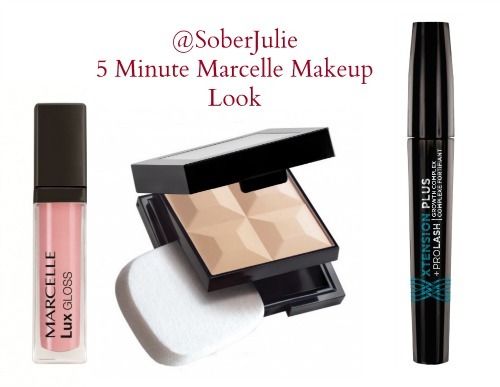 If you’re interested in seeing more of the products I use from Marcelle, I’ve written about them HERE on SoberJulie.com and also you might want to check out the Sober Julie Facebook Page, Follow me on Twitter or on Instagram. Do me a favour and follow Marcelle on Twitter, on their Facebook Page and check out the Marcelle website to get to know them. To see Stacey’s review head to This Lil Piglet HERE. 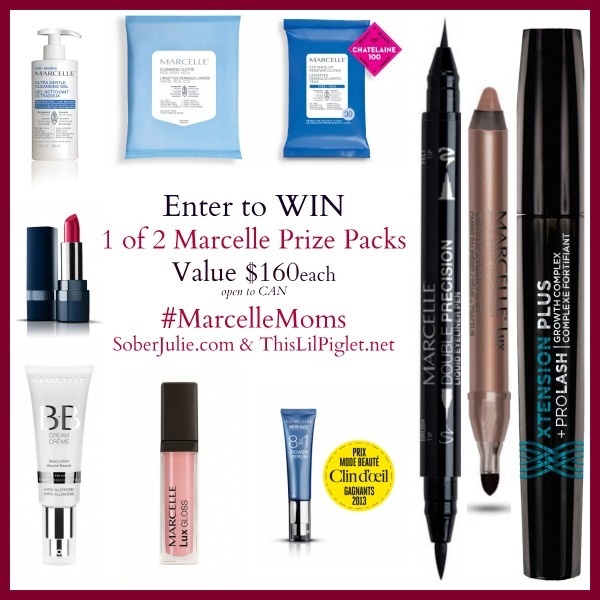 Disclosure: As a #MarcelleMoms advisor I was compensated for this post, however all opinions are my own. I need my BB cream! It has replaced foundation for me. I can’t live without lipgloss. Foundation! The beginning of it all! I can’t live without my mascara! 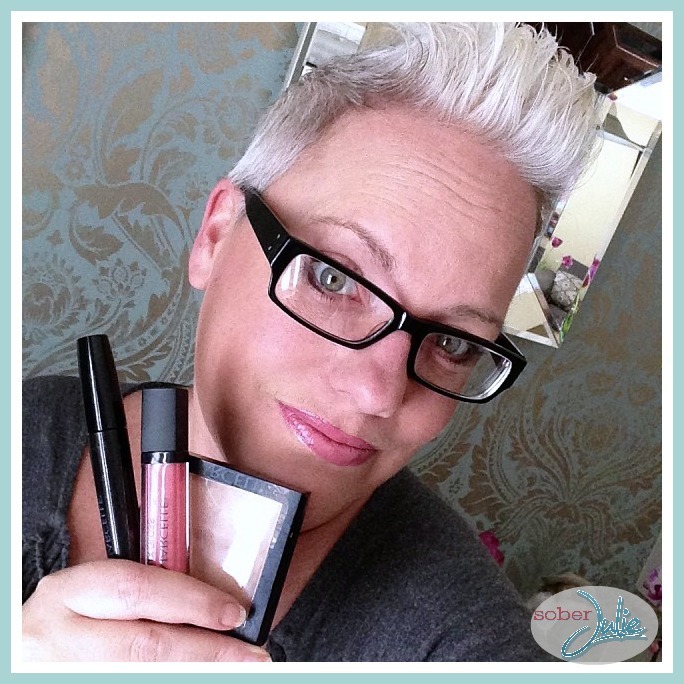 BB cream – it does so many things! WOW!! everything a busy lady needs to shine!! I love their bob cream! I cant live without my bb cream, sometimes its all I wear! It’s a toss-up between eye shadow and lipstick. Feel naked without them. Gotta have my BB Cream! I can’t live without concealer. I still have breakouts! Don’t wear a lot of makeup.. can’t do without moisturizer though! I cant live without my eyeliner. Got to have lip gloss. My pressed powder, I need it. Chapstick! but thats why I need to win! Momma of 4+ needs to feel pretty! Nothing makes as big of a difference on me than eyeliner does, so I’m going with that! I’m all about the eyes so it’s mascara for me! Lipstick is a must for me! I can’t live without lip gloss. I can’t live without eyeshadow! Can’t live without my mascara! I cannot live with out mascara!